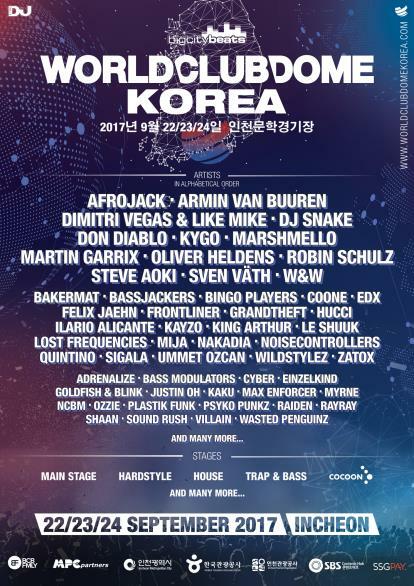 SEOUL, Aug. 10 (Yonhap) — Norwegian DJ Kygo and Dutch DJ and producer Oliver Heldens are among the headliners for a large international electronic dance music (EDM) festival coming to South Korea next month, the event’s local organizers said Thursday. MPC Partners announced the second lineup for World Club Dome Korea 2017 to be held on Sept. 22-24 at Munhak Stadium in Incheon, just west of Seoul. The international electronic dance music event was launched in 2013 by BigCityBeats, a German radio station specializing in EDM. World-renowned DJs perform and around 150,000 people attend the event in Europe every year. It will be the first time it has taken place in Asia. Kygo performed at the Rio Olympics closing ceremony last year. This will be his first-ever performance in South Korea. Heldens was ranked No. 8 on the “Top 100 DJ” list issued by the British music magazine DJ Mag. The lineup also includes Felix Jaehn, Grandtheft, Bakermat, Bassjackers, Bingo Players, Coone, Frontliner, King Arthur, Mija, Nakadia, Noisecontrollers, Ummet Ozcan, Quintino, Sigala, Hucci, Kayzo and Zatox.